Actuna Pagoda-2B STUB FPV 5.8GHz LHCP - Actuna Sp. z o.o. 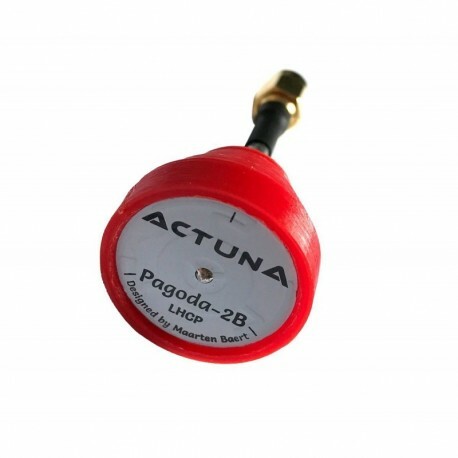 Actuna antenna Pagoda-2B STUB in the 5.8 GHz band dedicated for FPV such as racing drones and preview video. Each antenna is tuned and measured individually and gets its own parameters tab. Parameters tab is serial number and the minimum and maximum SWR. This allows you to select the channel for best transmitter parameters, which allows you to get the best image and greater distance. Each antenna has a cover printed from ABS in 3D technology. For every purchase we are adding a set od 3D printed items, helpful gadgets. Items printed in 3D technology can have different colours and are chosen at random. The antenna was designed by Maarten Baert on license Creative Commons Attribution-ShareAlike 4.0 International License. Home page of the project Anteana Pagoda.